The U.S. Justice Department on Monday asked a federal court for 90 days to review an agreement reached with Baltimore for the city to enact a series of police reforms in how officers use force and transport prisoners, court documents showed. The city and justice department reached the agreement, known as a consent decree, in January, almost two years after the death of a black man, Freddie Gray, of injuries sustained while in police custody sparked a day of rioting and arson in the majority-black city. It also led to an investigation that found the city’s police routinely violated residents’ civil rights. Gray, 25, died of injuries sustained in the back of a police van in April 2015. His was one of a series of high-profile deaths in U.S. cities from Ferguson, Missouri, to North Charleston, South Carolina, that sparked an intense debate about race and justice and fueled the rise of the Black Lives Matter movement. 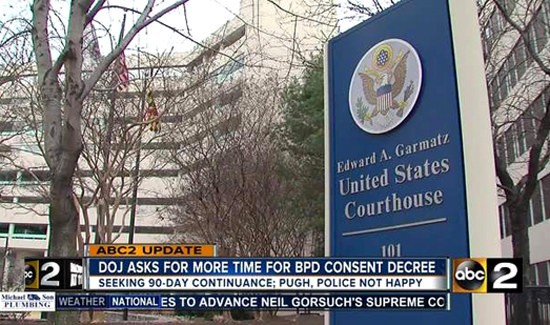 The Justice Department needs the 90 days to review the agreement as it develops strategies to support law enforcement agencies throughout the U.S., lawyers for the department said in a motion filed in United States District Court for the District of Maryland. “The Department has determined that permitting it more time to examine the consent decree proposed in this case in light of these initiatives will help ensure that the best result is achieved for the people of the City,” they wrote, asking for a hearing set for Thursday to be postponed until June. Baltimore Mayor Catherine Pugh opposes the request for an extension, she said in a statement. “Much has been done to begin the process of building faith between the police department and the community it seeks to serve. Any interruption in moving forward may have the effect of eroding the trust that we are working hard to establish,” she said. Attorney General Jeff Sessions said in a memo also filed to the court that the Justice Department will review all consent decrees and other police reform agreements that are in place with more than a dozen cities.